The new Porsche Cayman S shares many parts and suppliers with the lower priced Boxster model on which it is based. Getrag's six-speed manual transmission and ZF's five-speed automatic transmission are offered on both the Cayman S and Boxster. Leoni provides the full wiring harness to both cars. ThyssenKrupp Bilstein's adaptive shock absorbers are available as an option on both cars as part of Porsche's active suspension management system, which costs about E1,500 in Germany. Bilstein executives expect half of the buyers of the Cayman S to pay the extra price to get the shocks compared with about 15 percent of Boxster buyers. Porsche is adding the Cayman S to help improve its sales mix: "With a sticker price E7,000 higher than the equivalent Boxster version, and probably only marginally higher costs, [the Cayman] should generate a very solid margin," said Deutsche Bank analysts in an equities research note in September. Most of the Cayman S models will be built at Valmet Automotive's assembly plant in Uusikaupunki, Finland, where the Boxster also is made. 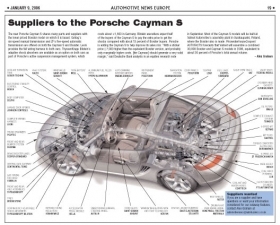 PricewaterhouseCoopers' AUTOFACTS forecasts that Valmet will assemble a combined 30,000 Boxster and Cayman S models in 2006, equivalent to about 30 percent of Porsche's total annual volume.